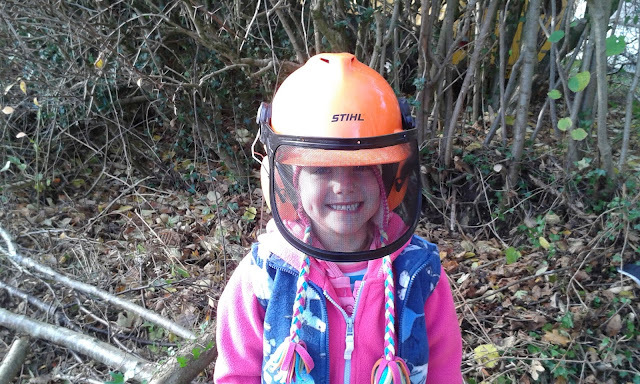 This blog is about what I make but I think you may have come to realise we are a pretty resourceful family all round. 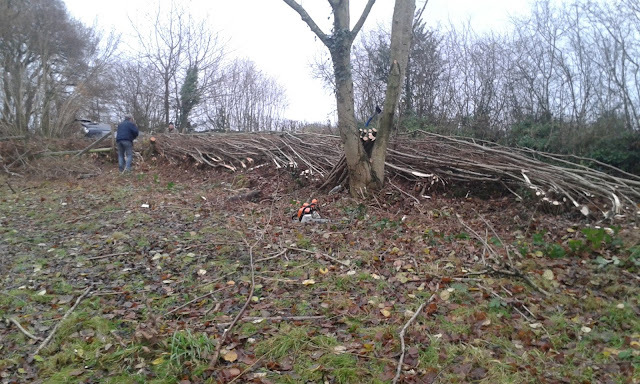 Today I want to share with you my bloke's project over the winter which has started to come alive now that it is Spring. This is actually the end product. 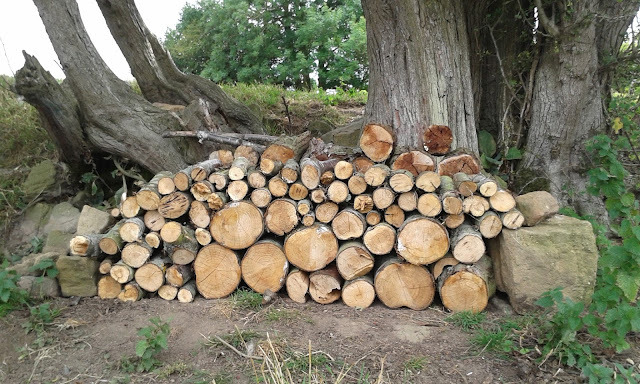 A tidy stack of wood to burn on the log burner at the cabin. There was a little investment present wise for this project when I bought him this helmet for his birthday last August and he purchased some new tools. He went on a hedge laying course to learn how to cut the base of the wood but leave enough for the sap to rise in the Spring to form new growth. Three places were booked: one for him, his brother and his dad. He was very excited about it in the run up to the weekend course - he even washed his boiler suit! 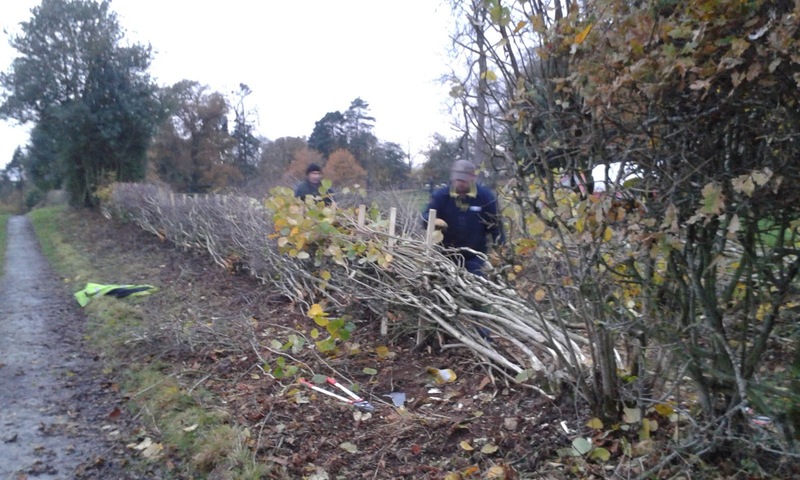 This is the hedge before laying. It had grown into a full row of Hazel, Holly and Field Maple trees over the years but really needed to be a hedge to stop it restricting traffic on the road. Plenty to practise his new skill on. You can only lay a hedge between October and February because of nesting birds and of course encouraging the wood to regrow. Here it is after many weekends of work, taking a photo in the same spot as the one above. So I am no longer a weekend hedge widow. Work has stopped and he is pleased to see the Hazel is throwing out new shoots. Hooray! We can all talk knitting here but my bloke has talked hedge for a long time now. I don't mind, I like someone with a passion for 'their' thing, what ever it might be. 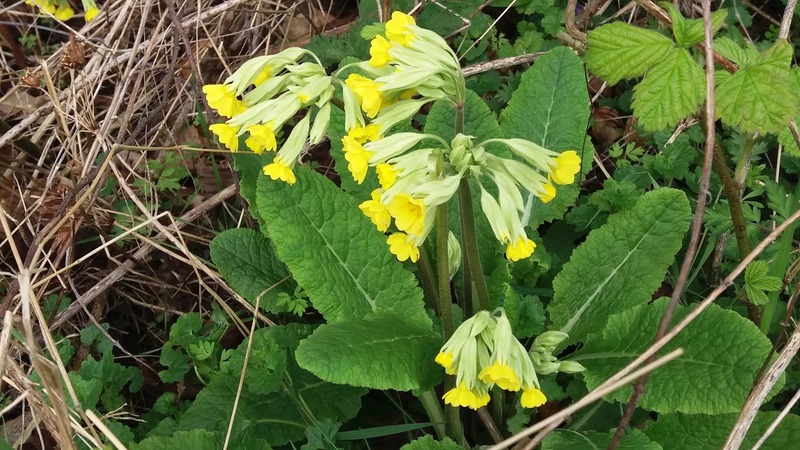 The light can now get through to the base so look at these lovely cowslips - a childhood favourite of mine. 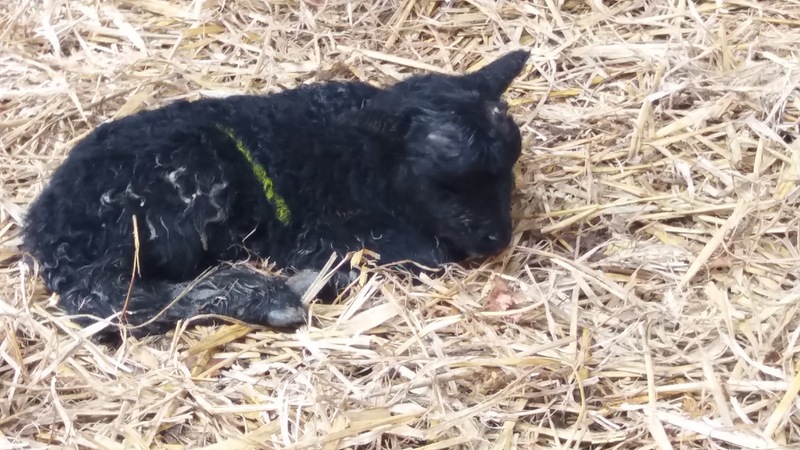 and whats more but a few more of these little lambs, this one is still damp. That's really interesting and I am impressed at the end product! 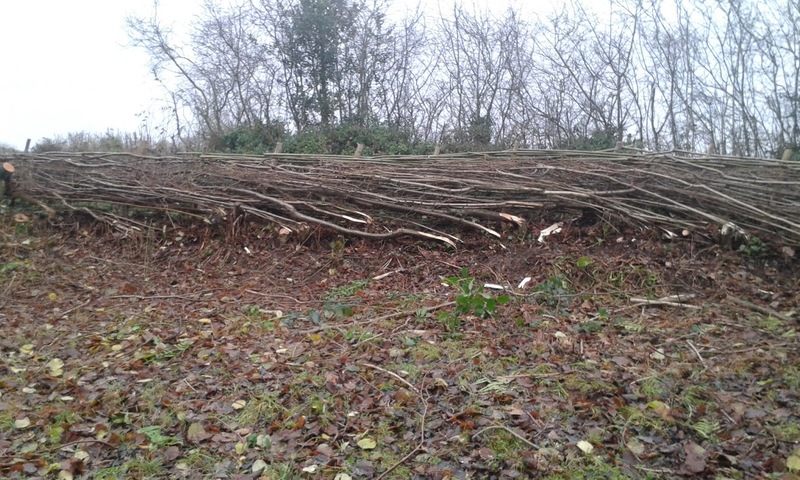 It looks like it would have taken ages to clear the wood first and then to set in all the stakes and weave the live Hazel around the stakes! It's great to see the new shoots coming through. I'd love to see an update later in the Spring. Wow, that is impressive.Its good that these skills are still being taught, and that people still want to learn how to do them. Looks hard work ! Well done on the hedge. Who knew it was so complicated? Love the little lamb, so sweet. Talk about labor of love. That is a LOT of work. Brilliant work by your hubby. I love to see these traditional skills thriving and the results are so impressive. My dad was a pretty good dry-stone wall repairer...another great rural craft. Hope you do us an update in a couple of years. 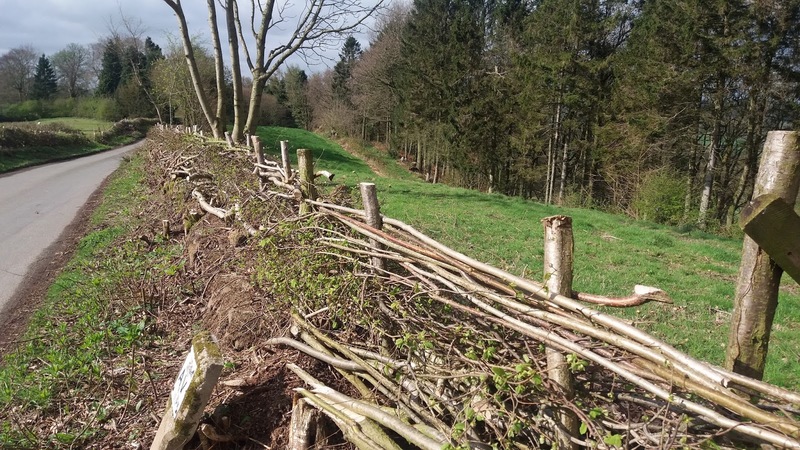 My late Dad was an agricultural worker and also knew how to lay hedges. They look wonderful once they are done. 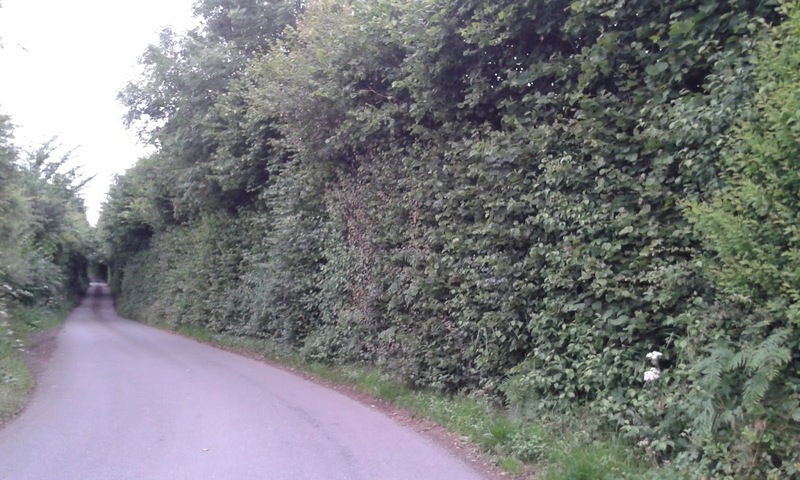 There are all kinds of county variations of different types of hedges too. What a great job your husband did! I find this and other woody things very fascinating indeed so I can see why your husband has been enjoying it. Oh and I agree, good for men to have their own interests! p.s. can you drop me an e-mail so that I can get in touch with you about something, not sure of your e-mail! Looks like a good job done there. Well done.